Drama. Highfields Capital is a Boston-based hedge fund, founded in 1998, which now has about $11 billion of other peoples money under its management. And they want more cream in their coffee and sugar in their tea, served up to them by Tim Hortons in the back office, boardroom, or takeout window, wherever (Reuters, April 30, 2013, Tim Hortons investor agitates for buybacks, new strategy). Highfields Capital brings nearly four months of experience to the business, a fine taste, and a middling investment of about $110 million for a 1.6% stake in the company, acquired as late as December last year at $50 per share, and wants the $8 billion company to take its considered advice and petition, and borrow $3.4 billion on the corporate account, and buy them back, and 50 million more, in a gesture of goodwill to all the shareholders, at $59 per share (ibid, Reuters). Brilliant! What an idea! Instant coffee for everyone! 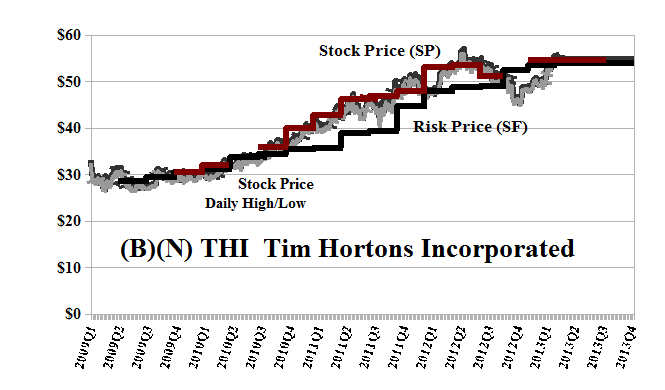 In contrast, Tim Hortons has been in the Perpetual Bond™ most recently since $30 to $35 in 2010, almost three years ago, and is in the Perpetual Bond™ now, despite difficult expansion in the U.S. and the nearly saturated Canadian market. Our estimate of the downside risk due to volatility is minus ($3.50) per share and a stop/loss at $50 could put it below the current risk price of $50 and rising (please see Exhibit 1 below). The dividend is $0.26 per share per quarter for a total payout of $160 million per year to its shareholders and a current yield of 1.9%. We’re inclined to buy the July put at $54 for $1.30 per share today and sell the offsetting call at $58 for $0.30 – net $1 a share from our profits or about the cost of doughnut – and see how things work out with a guaranteed price of no less than $54 and no more than $58 for the next several months, while we wait for another balance sheet and more information. That would be enough sugar for us. We have to admit that Starbucks has been growing much faster, but the U.S. is at least ten times as large as the Canadian market, so maybe Tim Hortons has room to grow. 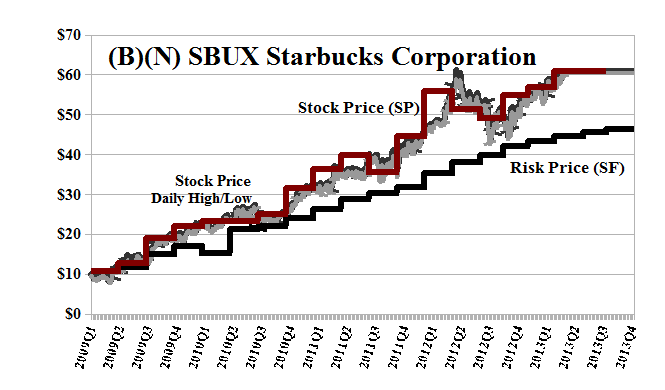 Starbucks is now a $45 billion dollar company that has been in the Perpetual Bond™ since $10 in 2009 and is currently trading at $60, much closer to what the Highfields Capital folks would like to have for Tim Hortons. The dividend is $0.21 per share per quarter for a $630 million per year payout to its shareholders and a current yield of 1.4%. Our estimate of the downside risk due to volatility in minus ($4) per share, which we can afford, but we could also look at a “collar” if they don’t plan to raise the dividend this year. Perhaps we should write them and ask for a sweeter deal there, too, so that we don’t have so much trouble making money the old-fashioned way, by patiently earning it; or, Highfields Capital could have bought a cup of coffee and a “box” of the dozen companies of the Dow Transports that we served up in December, and done even better. Please see our recent Post, The Dow Transports, March, 2013. Stock prices that are less than the price of risk are “bargain prices” but with the risk attached that the company might never get a higher price other than that due to ambient volatility or “surprise”. On the other hand, investors who are willing to pay the “full price” above the price of risk, and buy and hold the stock at those prices, must also be confident, and have reason to believe, that the company will produce those values, absent new information. Please see our Posts, The Price of Risk, August 2012 and The Nash Equilibrium & Its Stock Price, October 2012, for more information on the theory, and for more of our view on the current markets, The Wall Street Put, April 2013, and earlier Posts such as The Dow Transports, March 2013, or The Risk Adjusted Dow, March 2013, or The Canada Pension Bond, February 2013.